Organising a Christmas Horse Show was neigh problem for our Level 3 Extended Diploma in Equine Science students, who are studying event management as part of their course. They held classes in showjumping, dressage and turn-out, with the entry fees going to one of their favourite charities, the British Thoroughbred Retraining Centre. Sharing that festive feeling are Georgina Richards, Eleanor Dickenson with ‘Charlie’, Hollie Tyler, Sophie Scott on ‘Keith’ and Jessica Bell. http://reaseheathblog.org/equine/wp-content/uploads/sites/8/2016/11/World-Horse-Welfare.jpg 720 960 reaseheathblog http://reaseheathblog.org/equine/wp-content/uploads/sites/8/2017/05/reaseheath-logo-web-header.png reaseheathblog2016-10-28 16:12:492016-11-04 01:41:00What jam packed week! http://reaseheathblog.org/equine/wp-content/uploads/sites/8/2016/11/Eilberg-dressage-visit-.jpg 720 960 reaseheathblog http://reaseheathblog.org/equine/wp-content/uploads/sites/8/2017/05/reaseheath-logo-web-header.png reaseheathblog2016-10-26 15:25:522016-11-04 01:39:50Students visit international dressage riders, the Eilbergs! Equine consultant Richard Maxwell is a horse behaviourist and a qualified Masterson Method Practitioner who combines a unique blend of natural and traditional methods of horsemanship to help horses and their owners. The work of Richard is renowned across many equestrian disciplines and at all levels, with his clients including the likes of International Event rider Sharon Hunt, Dressage star Matt Frost and Tom Dascombe, Racehorse Trainer at Michael Owen’s Manor House Stables. Richard’s approach always begins by gathering information to help him assess the particular needs of every horse that he is asked to work with. He first spends time with the owner to gain their feedback and to discover goals and objectives. Richard started his career in the army, joining a tank regiment. When the draw of horses became too great, he transferred to the Household Cavalry where he became a riding instructor training Life Guard Subalterns and producing young horses for the military. In 1988, Richard’s own introduction to ‘natural horsemanship’ came through a chance meeting with the legendary Monty Roberts. “Monty came over to the UK to give a demonstration for the Queen whilst I was in the Household Cavalry. A rider was needed for the demo and I was volunteered,” said Richard, who is based at Barnley Equestrian Centre in Suffolk along with his wife Sam. Richard’s approach to training horses has evolved throughout his career. He believes that, in most instances, equine behavioural problems have their genesis in pain. Because of this, he begins by treating any residual physical discomfort using techniques inspired by Andy Andrews and the ‘Integrated Equine Performance Bodywork’ system founded by Jim Masterson. The Masterson Method aims to relieve stress and tension at key junctions in the horse’s body and this system of ‘bodywork’ encourages a horse to seek active participation in the treatment rather than simply tolerating the procedure. At each demonstration, Richard encourages his audience to realise that issues cannot be resolved within a single session. His ethos is to evaluate each horse and to try to empower owners by arming them with the tools for further development. “I often encounter a sense of hopeless with clients who are dealing with a ‘problem’ horse, so I try to offer them a starting point from which to deal with their issues,” explained Richard, who worked with three very different horses during his visit to Reaseheath. Echo is a 6-year-old Thoroughbred gelding who was bought off the race track by owner Julie Price. Julie’s aim is to do some riding club level activities with Echo but the duo have been experiencing some tension-related problems. Said Julie, “Echo found the atmosphere at Reaseheath a little overwhelming and was totally unmanageable at first. Richard was able to turn a hysterical horse into one which was calmer and easier to handle. There is a long road ahead, but Richard has given me some tips on how to help Echo in the future”. Easter Bunny is a KWPN gelding who is working at Advanced Medium level dressage. He was purchased as a 4-year-old by owner Penny Lindop, specifically for dressage rider and List 4 BD judge Toby Blake to compete. ‘Bunny’ has an impressive CV and, in 2014, the son of Valdez was a finalist at the Shearwater Young Dressage Horse Championships. The striking chestnut gelding has since competed at the Summer National Dressage Championships at BD Novice level and at the Winter Dressage Championships at Elementary level. Earlier this year, whilst competing at Hartpury College, Bunny was overcome by ‘stage fright’ in the indoor International Arena, becoming very tense and strong. Due to this, Penny was keen to gain Richard’s advice. Penny Lindop, owner of dressage horse ‘Easter Bunny’. Harvey is a 14-year-old Welsh Section D who is owned by Clare Broad. This combination regularly competes with British Dressage and enjoy jumping, showing and hacking. Clare applied to attend the demo as Harvey has been experiencing issues with loading especially when traveling alone. “I learnt a lot from Richard Maxwell; his methods and techniques really worked for Harvey and after the session, he was even loading himself without a rope or being led. I am thrilled with the outcome and have lots of new ideas for future training. I love Richard’s approach and his understanding of our four-legged pals,” said Clare. 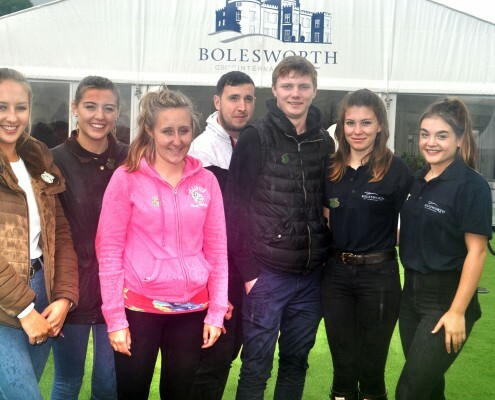 Several of our departments worked in partnership with Bolesworth International, enabling our students to gain experience of event management at a worldclass level and to network with influential individuals and organisations within their industries. We have been supporting this spectacular showjumping event for several years and our students again proved indispensable to the smooth running of the action packed programme. A team of 40 Level 3 Diploma in Horse Management students provided the arena party over five days, working alongside international course designers Bob Ellis and Kelvin Bywater, and were also on duty for the popular dressage to music competition. The show attracted leading competitors from 13 nations, giving our students ring side seats for the sport at its highest level. Classes including a puissance (high jump) competition, which saw two riders clearing a 7ft 3 in wall to the delight of spectators. Elsewhere our equine undergraduates took on responsible roles in the Equine Learning Zone and Fan Zone. This gave BSc Equine Science undergraduates Louise Doyle and Jamie-Lee Bowness an amazing opportunity to rub shoulders with dressage Olympians Carl Hester, Charlotte Dujardin, Laura Tomlinson, Richard Davidson among others as they took part in a Q & A session with fans. The undergraduates also helped to promote educational presentations by vets, nutritionists and key equine organisations and supported the British Horse Society and The Brooke equine charity with promotions. Read more about our undergraduates’ experience at Bolesworth here. Fellow students Hannah Hardy and Natalie Gillison also received useful career experiences. Hannah, who wants to be a journalist, shadowed Bolesworth International Press Officer Andrew Baldock while Natalie, a talented photographer, recorded some of the rider interviews in the Media Centre. Read Hannah’s top 3 Bolesworth moments here. 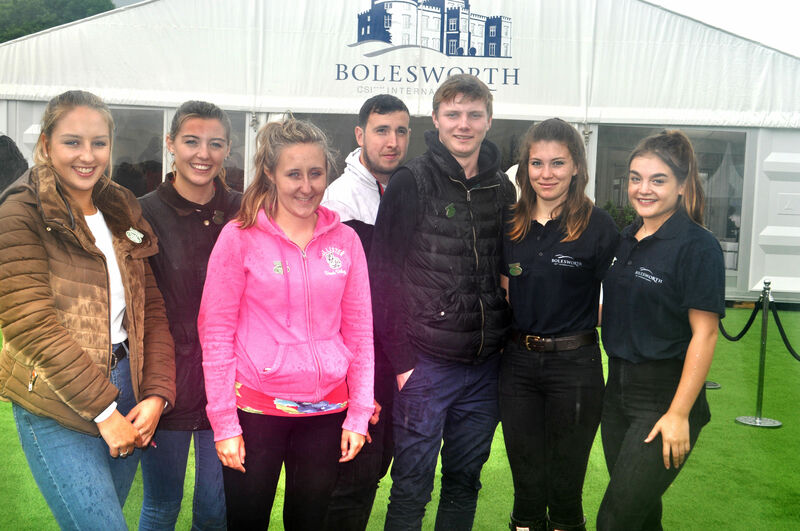 Our Level 3 Diploma in Events Management students were again responsible for guiding and organising activities for hundreds of local school children during Bolesworth Schools Day. They also supported the trade stands, helped to staff the busy Visitor Information Point and carried out market research to help show organisers enhance the visitor experience. The students benefit hugely from this high level event management experience and from the dedicated training sessions they receive.